This old store has so many interesting things in it! Mostly we were after their gatorade, though. This was the half-way point of today's 24.6 mile ride. Here's Ken standing in front of an old steam engine of some sort. There were lots of old interesting pieces of equipment here and apparently some of the machines they use to run the Ole Mill still work! There are cabins you can rent here and campsites too, but we have never seen the park actually open. We snuck in today to get out of the rain, but as soon as we left it poured on us for the last 5 miles of our ride. This looks like a little cabin, but it's actually a stage. There are no sides or back, just a front. We saw a piece of paper advertising a past event and apparently they play folk/bluegrass music here from time to time. In May they had a couple of dulcimer players here. I bet they weren't as good as my mom!!! Seeing trash along the side of the road is one of our least favorite parts of riding through rural areas. It seems some people think that just because no one is looking they can dump their trash wherever they want. Ack. This looked to us like it used to be an old garage. There were broken headlights everwhere. One of the organizations that we both appreciate and support is the RTC, the Rails-to-Trails Conservancy... I would like to explain why. RTC transforms old railroad routes that are no longer in use (duh) into some of the most scenic bikeways I have ever experienced. Jen and I have found some very beautiful roads to ride and are sure we will find more.... but with roads come autos which can be big distractions and raise safety concerns. We do own a car and admit that in the world today they are needed for quick long distant travel.... but they can be cumbersome to the bicyclists. On Rails-to-Trails there are no cars. And there are no hills. Since the railways were originally built for steam locomotives, and these big trains could not haul heavy loads up hills, they made the routes flat, literally cutting through the mountains. These same routes have become beautiful trails with amazing scenery that you just can't see by auto and they can be found in every state in the US. Our first experience with Rails-to-Trails was in Ohio. It was a challenging time for us - we were staying with family, had totalled our truck and were feeling quite defeated and uncertain of our future. So we took a chance... we used what little money we had to buy mountain bikes, packed some stuff and set out on a bicycle trail not far from where we were staying. We did not know what a "Rail-to-Trail" was at the time. We just knew that there was a bicycle trail that ran to Cincinatti. We took our time (we were so not in shape) and spent many days (and nights) on that trail. I remember leaving Springfield and experiencing the beauty of the trail... and how everything just slowed down. There was peace there. The first night we outlaw camped outside of Yellow Springs. We woke up in the middle of the bright moonlit night and found we were surrounded by deer moving slowly all around us. In awe, we lay still just taking it all in. I think Jen and I both realized at that moment that our life was about to change for the better. And we were right. That was the first night and the rest of the trip was even more incredible. Taking in the beauty and visiting the small towns and people on the way showed us so much. It actually began restoring our faith in humanity and in ourselves. Our little trip on that bike trail was the beginning of a very life changing turn of events and some very good seeds were planted... seeds that have begun to grow in the life we are now so grateful to have... seeds that next Spring will grow into a ride across the United States. Our bike trip in Ohio led us to where we now live in North Carolina and we have continued to ride the nearby Rails-to-Trails with each one having it's own special quality. The nearest one to us at this time is the American Tobacco Trail. We plan to have a short bike rally for the organization 350 there in October. There are many, many miles of train tracks not in use in these United States today. They just sit there rotting and rusting. With CO2 reaching levels never experienced on this earth in millions of years and the devastation it is causing our planet... I believe more bicycling could be a simple and fun way for many people to become a part of the solution. Unused railroad routes link small communities together and could provide a safe environment for not only bicyclists but also for pedestrians, skaters, and even horseback riders. Anyway just wanted to let you know and if you haven't experienced a Rail-to-Trail go check one out and see for yourself. Then you will understand why we choose to support this incredible organization. I will leave this with a song by one of our favorite artists Jack Johnson http://www.youtube.com/watch?v=5jISrnID-CI Love you all and have a peaceful day. This is a new old covered bridge that is still under construction. For some reason there is a podium type thingy bolted to the wall so Ken, being ordained and all, was strangely drawn to it. A close up of the bikes we ride - when we took them to the bike shop to get worked on, the guy working there said, "You ride how far, on THESE??" They are very heavy and um, inexpensive. We sure get a lot of enjoyment from them, though, even if they aren't high-precision machines. The reflection of this white horse in the water caught my eye as we rode today. Diane knows the people who own this place and said they built their house and barns out of wood from their land. We did not expect to see this as we were SPEEDING on our bikes to the bottom of this hill! The two men in white shirts were not in uniform but they were police officers. They were stopping drivers and asking to see their licenses. They just smiled at us and waved us on through. :) Apparently they were looking for some real bad guys. I would like to talk a little bit about Global Warming..... I know I know it's the rage this season.... It's a fad the yuppies and hipsters are making a big fuss about while drinking their lattes. This was the attitude I took after hearing so much about it. But I decided that I would look into it more and what I found out troubled me considerably. At the rate our planet is warming because of the amount of co2 being released in this world the Artic will be iceless somewhere between 2011 and 2015. You kinda have to give some thought to what impact just this one occurence would have on our environment worldwide. (To find out more about this please visit the link 350 given in our post Just Be-Causes). Let's face it, at the present rate of co2 being released into the atmosphere it's not "if" it is going to happen it is "when." Already scientists have changed their predictions to 80 years sooner than they first thought. Global Warming is happening at an alarming rate. Like the tobacco companies did when the public started becoming aware of the hazards of tobacco smoke the oil companies started thier own propoganda coverage leading people into believing there is nothing to worry about. Do not take my word for it, but.... I challenge anyone to investigate this thoroughly and prove that global warming is a myth. After investigating this myself I believe we do have a problem and Jen and I have started changing our lifestyles accordingly. Individual change is important.... When you have enough people that become aware and band together great change can happen. Changes in individual lifestyle must change...... but not only that, changes in our industries must also. A complete overhaul. I believe education is important in accomplishing this....and then just doing it. Jen and I find ourselves bicycling a lot now. We find that life has slowed down for us and we see our environment in a more wholesome way than we were flying around in an auto. We plan plan to bicycle across the United States on the TransAmerica Trail and then down from Oregon to L.A. (thats about 6000 miles). We hope to gain a better perspective of this great country we live in and pass on the message of global warming and other issues we find important along the way. Though this sounds like it might not be all that much....I am sure we could have a positive impact on people's lives and our own. It all starts with us.... one step at a time.... Those reading this might want to ask yourselves what you can do as an individual.... some of the links listed here on our blog could be a good place to start. By the way those Lattes are really quite good. Check 'em out and feel free to leave comments to tell us what you think! Thanks! our bikes to be fixed! We always stop to help someone we share the road with. :) This was our only "save" today. Usually we see more turtles in need of a little well-timed lift to the other side of the road. This is someone's carport. We are guessing they made it out of an old building that used to be a gas station? We found this place today and discovered that it had not a single locked door. That meant we got to explore it, which was interesting, but it also means kids could get hurt if they decide to do the same. We are going to do some research on this company and see why they've made, and left, such an ugly mess. Yuck. There were warning signs all over this place, but not a single "No Tresspassing" sign. It was creepy and gross both inside and out. We are curious to find out just what kind of products they were researching. I am not a big fan of spiders but when I saw this one near our back door I couldn't stop looking at it. I had never seen a spider with spikes on it and it's web is so unique and beautiful I had to do some research and find out what in the world this thing was. 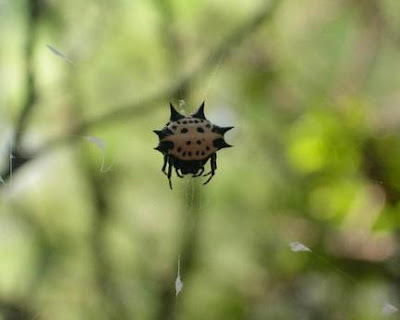 It is a tiny species of orb weaver, appropriately nicknamed "Smiley Face Spider" because of the marks on it's body. They come in many colors. Some of them have red spikes or orange bodies, and they are harmless. I never thought I'd say this, but isn't this spider TOO CUTE??? We found this neat little consignment shop out in the middle of nowhere today. It's called "New to You" and it's run by a sweet little lady and her husband. They had the neatest stuff! On today's 25.5 mile ride we spotted the rare Dalmation Moth in it's natural habitat. Not really. It's just a regular moth, we think, but prettier than most. There are no cooler shoes than half-price Chuck Taylors with custom laces! We were thinking of exploring this abandoned house, but we saw a bike and a backpack sitting on the front porch, so we decided not to mess with it. We guessed it was probably a fellow biker looking for shelter from the storm that hit just a few moments after I took this picture. The rain meant only an 11 mile ride for us this time, but it was still a great workout. Satan squirrel loses his tail! This was our second ride on this trail. It rained the first time, and it rained again this time. We sat out the worst of it at a rest area, but still got wet and muddy. The trail isn't paved so it was a tough ride, but we did it much faster this time. It's evident by Ken's reflectors how dark and ominous it was getting!! Ken got new glasses! He is so happy to be able to see again! Call me crazy, but if you look REALLY CLOSE at this tree, I think you can see Jesus! We had resisted the urge to eat some of the corn in the fields we rode by, until this rogue stalk proved too much to resist. Ken eating the corn from the rogue stalk. We spent our morning here, trying to play tennis. Luckily there was a tennis class going on so we were able to eavesdrop and pick up a few pointers. :) It had been over 20 years since I played! Today's ride was 18.4 miles around a neat little historical town called Pittsboro. It was really nice to be able to stop and cool off next to the river, and that is where we found this great sign! It pretty much sums up what we are doing with our lives these days! Many of the "bike trails" we ride on are simply highways with these signs on them every few miles. This will be the last photo you will see of Ken in these shades - he lost them on today's ride. This is a sweet little donkey we stopped to say hello to. We gave her some of our trail mix and she seemed sorry to see us go. The Haw River, near Pittsboro. We crossed this rocky river twice today.